Micro Tyco is a social enterprise project which raises money for Wild Hearts Charity providing small start up loans to entrepreneurs across the world. 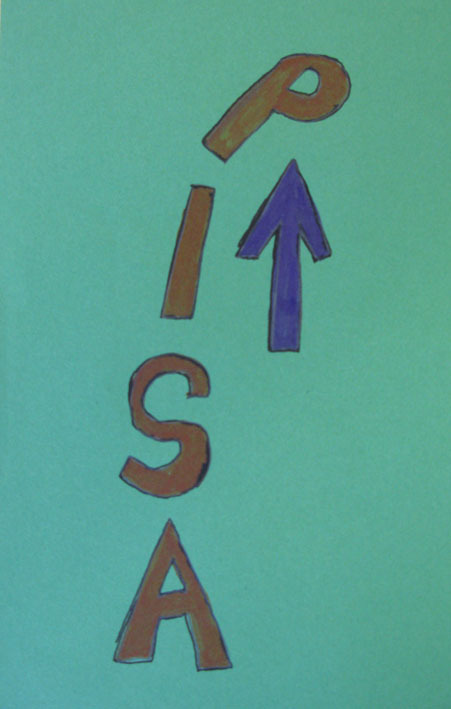 All of the OLHS S3 tutor classes are taking part and using this to certificate two SQA units – Self Awareness and Enterprise Activity. The S3 teams are given £1 seed money which they then need to ‘grow’. Last year we had 32 teams so from £32 seed money we managed to send back £550 – we are hoping to beat that this year. Micro Tyco began for OLHS on Friday 1st November and runs for four weeks. Thanks (in advance) for your support. For the second year, we have been running our FreeRice Challenge to raise funds for the United Nations Food Programme. Over the first week, tutor classes discovered which countries are worst affected by hunger, how much rice is necessary to keep an adult alive per day, and how the FreeRice website helps feed hungry people. 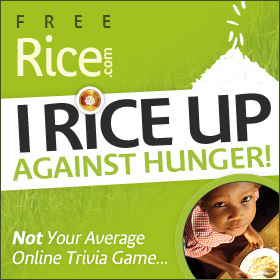 The FreeRice website itself is a series of multiple choice questions and for every correct answer, pupils add ten grains of rice to their total. This rice, paid for by organisations promoting literacy and education, is then transported wherever it is needed. Throughout week two, tutor classes took part in the FreeRice Challenge, with classes all trying to outdo each other. Even in the middle of school show preparations, captains’ interviews and arrangements for the end of term, we managed to collect a staggering 131,593 grains of rice. The best performing class (with some scores still to come in) is 6C (Tutor: Miss Campbell), closely followed by 3M1 (Miss McGhee), 2M1 (Ms McGinty) and 2S2 (Mr Pegard). Congratulations and thank you to everyone that took part. For the next two weeks, tutor classes will be focusing on FreeRice, helping to raise money for the World Food Programme. For the first week, classes have the chance to practice using the website, and next week, we start the competition between classes, houses and year groups. Last year’s results are below. During the competition itself (week beginning 17th June), each class participating sends a total (or in the case of classes using a computer suite, an average per computer) which will be added to their scores and published daily in the bulletin. FreeRice is a website that encourages you to improve your English, French, Science, Geography and Art knowledge while simultaneously providing food for hungry people in the developing world. Each page of FreeRice has a question. If you answer that question correctly, you’ve gained 10 grains of rice for the United Nations World Food Programme. The rice is paid for by sponsors whose adverts pop up at the bottom of each page. To find out about hunger in the world today, look at these Hunger Statistics. Click here to find out more about FreeRice. five adults for one day. Let’s feed more hungry people this year. Wonder who this year’s champions will be? All RE classes are involved in fund raising for a numbers of very important charities. The projects vary from raffles, ‘soak the teacher’, non uniform day, coffee mornings, football tournaments. 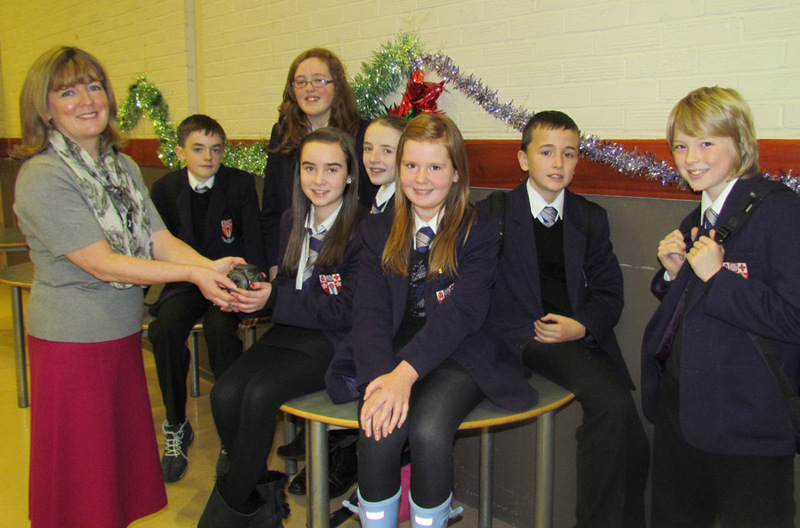 Pupils are encouraged to donate to the SCIAF wee boxes as often as possible. Pupils in the school are hoping to top the £2500 raised during Lent last year. All staff and pupils as well as a large number of invited guests celebrated the annual Patron’s Day Mass on Friday 22nd March. Bishop Devine, Father Frank King and a number of priests from local Parishes concelebrated the Mass. The school band and choir were at their best as they led the hymns and performed beautiful reflections. During this season of Lent Miss McGinness and CARITAS pupils have been collecting Easter eggs and small creme eggs. These eggs will be passed the residents of Park Springs Nursing home when a group from the school visit for an Easter service. The collection has been going very well and lots of Easter eggs have been handed in from pupils, staff and parents. Miss McGinness, Mrs Mulholland and the CARITAS group would like to thank everyone for their kind donations and hope to continue their appeal until the Easter holidays. The school was given 30 juvenile and 4 adult tickets for Friday Night’s Game. These were donated by Motherwell FC and were in great demand. The football was enjoyed by all who attended. A number of pupils and staff have registered for the Nevis Challenge in April. Watch this space for further information and photographs. Our annual SCIAF 24 Hour Fast took place on Thursday 21st March. Thanks to all staff and pupils who fasted and also to all who sponsored them. Stations of Cross for each House were held last week. Father King prepared and led the services. 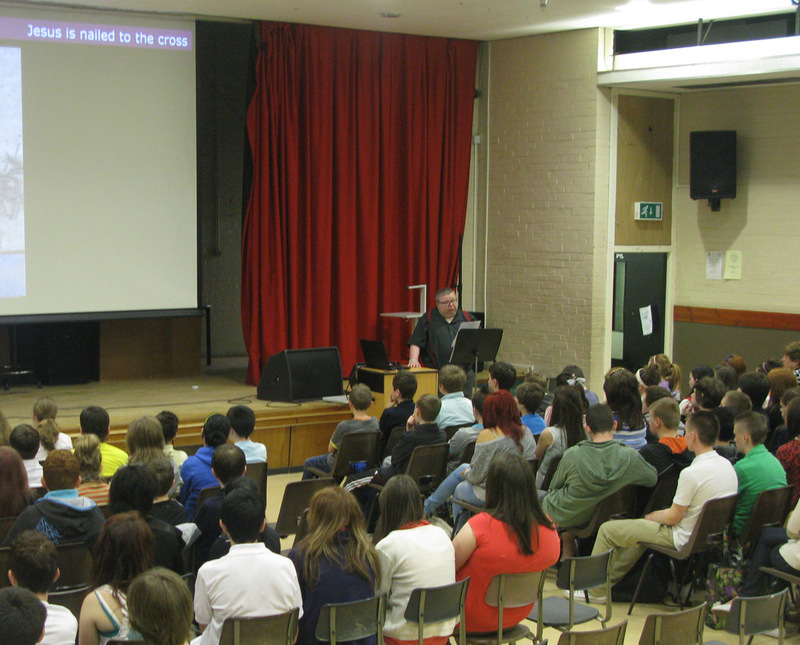 There was an information evening in the school last Tuesday night for pupils going to France and Belgium in June. The meeting in the school theatre was very well attended. Parents, pupils and staff were very impressed by the presentation by Mr Des Brogan, the of director of Mercat Tours. He explained that WW1 Cemeteries and Battlefields Tour is a moving experience and it has a profound effect on pupils, as it does with most visitors. Such a visit is highly recommended. The scale of slaughter becomes very real when you are confronted with huge war cemeteries around every corner, plus large monuments containing thousands upon thousands of names of young men whose bodies were never recovered. The words ‘lest we forget’ and ‘we will remember them’ will take on a new meaning to our young people. He told them that they would return changed people. Staff and pupils are very much looking forward to the trip in June. Adele Graham from Motherwell Women’s Aid is working this month and next with S2 pupils to support their Domestic Abuse topic. The Samaritans have been in to deliver a presentation to fifth and sixth year students about positive mental health issues and Self Harming. Any old Knitting Needles? We are appealing for knitting needles – any size and any unused chunky or double knitting wool to be handed into school for a knitting group who are making a blanket for St. Andrew’s Hospice. S3 Skills for Work, Health class held a fund raising coffee morning last Wednesday to raise funds for their trip and a charity of their choice. They prepared a selection of cakes and served the tea and coffee like true professionals. A large number of staff enjoyed the spread and attention. The School will close on Thursday 28th March for the Easter Holidays. Parents/carers will receive a letter and text giving further details. Pupils in 1st year found out about the Sconestone this week. The Stone was created by Warren MacLeod as a gift for his wife, a gift to be passed on inspiring small acts of kindness across the world. Since 2009, there have been 36 Keepers of the Stone as it has travelled from Scotland to Australia to Qatar to Canada to Austria to the United States and back to Scotland. Each pupil had the chance to hold and examine the Stone which is carved in the likeness of one of the ancient stone orbs discovered across the north of Scotland, and took the opportunity to think about how they would make their own kind act. FreeRice Challenge – final total! 200, 850 grains of rice!!!!! Congratulations and thanks to all of the Tutor Groups that took part. All Tutor classes are taking part in a FreeRice Challenge. FreeRice is a charity site that supports the United Nations World Food Programme. Each page contains a multiple choice question. Clicking on a correct answer adds 10 grains of rice to your total. The rice is paid for by sponsors’ adverts. There are questions about languages, geography, sciences, art, literature and maths, so there’s something for everyone. Click here to find out more about the work of FreeRice and statistics on world hunger. Running totals will be updated here each day. Monday 11th June OLHS pupils raised over 20,000 grains of rice in less than 30 minutes. Fr King ran a series of meetings about the Stations of the Cross in the run up to Easter, taking each of the school houses together during Tutor Time. Mr John McGilvery visited the school this week to meet with first year pupils. Mr McGilvery explained the work of the Gideon Society and gave a very interesting talk on its origins. The pupils then watched a video called ‘What’s in it for me?’ This gave a modern take on some bible readings and highlighted the daily readings, recommended in the Gideon Bible. All of the first year pupils were then presented with their own copy of the Gideon Bible. The school would like to thank the Gideon Society, in particular Mr McGilvery for their continued support. 2A1 Tutor class have decided to help tidy the school sensory garden and remove weeds as part of their ‘Eco-School’ topic. Each day during tutor time, the class have put on wellies and overalls and gone out into the garden to work. They’re doing a smashing job. Next week in keeping with the same theme, the class are planting sunflower seeds in pots in the Science labs. Hopefully, in the better weather, they will transfer them from the pots into the garden. Click on your year group and complete the survey. Thank you. 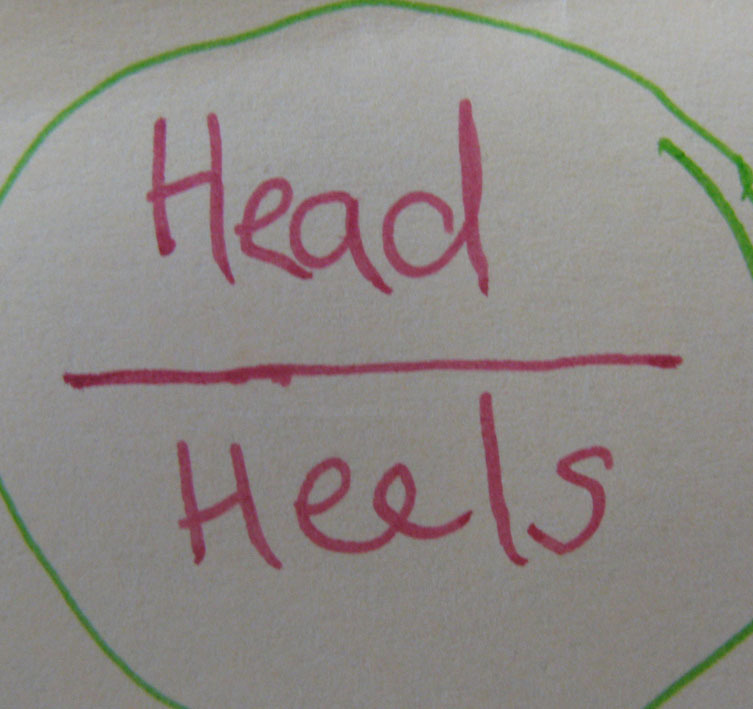 1st year pupils are using Rebus puzzles in Tutor Time as they learn how brains actually work. 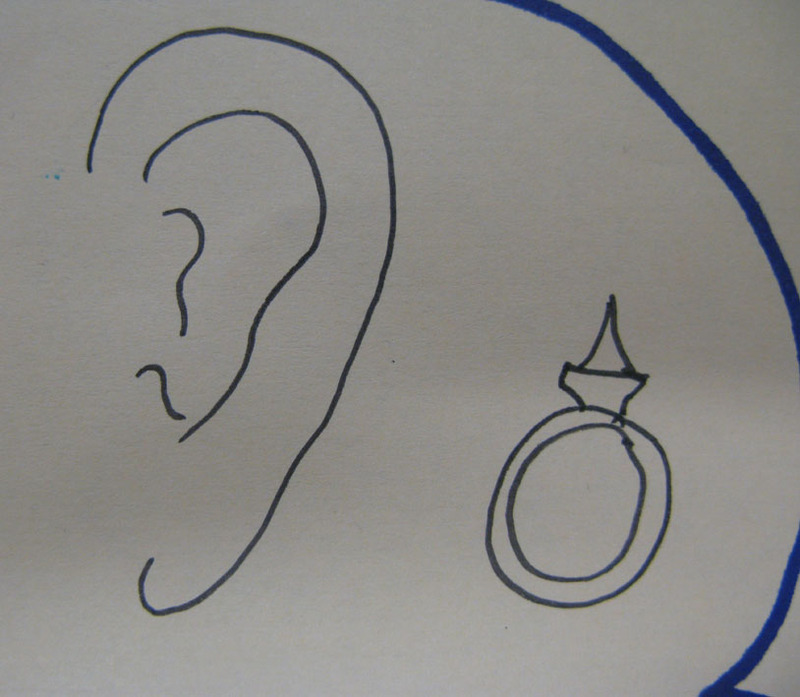 A rebus puzzle uses pictures and symbols and letters to represent a saying or word. Here are a couple of examples from Mrs Millar’s class. 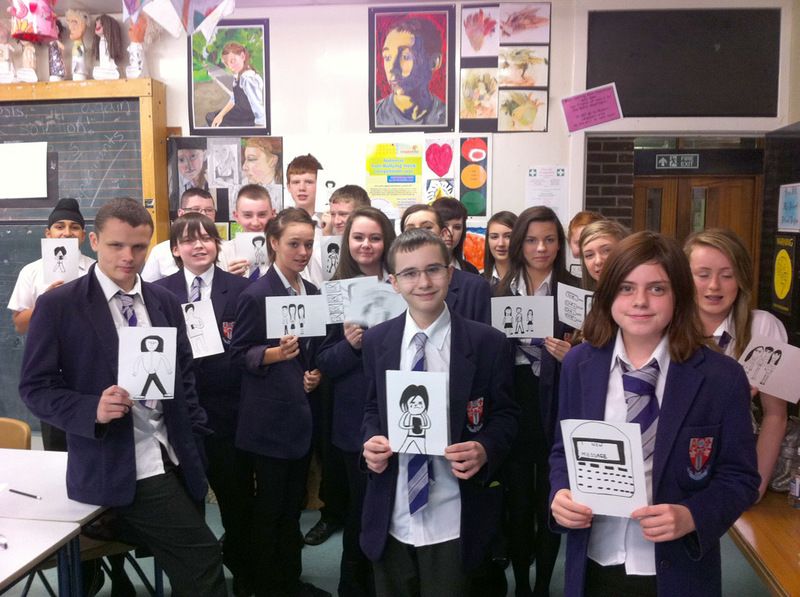 I am a pupil in Ms Steinert’s tutor class 3S2. During tutor time 2 weeks ago we were given the task of designing an animation about cyber-bullying. 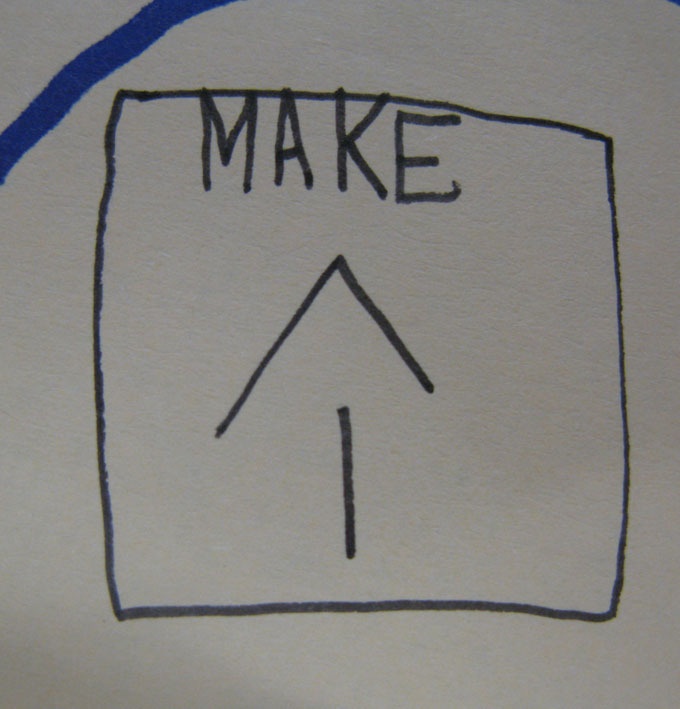 The first part of the project was to draw 6 small drawings on a storyboard. After all of the class had completed our storyboards we chose the best design and redrafted them onto an A5 piece of paper. The best drawings from all 6 groups were chosen and our lovely teacher Ms Steinert took time out of her busy weekend to animate our drawings with Adobe Flash. We hope this conveys a strong message about cyber-bullying and we entered our animation into the Respect Me cyberbullying competition. Our animation is now featured on the school’s website homepage.